The K5 Premium Full Control Home comes with an additional hose reel on the back of the unit, making winding and unwinding your hose easy. This product comes with a five year warranty. If you need further assistance please call our office on 01473 636663. The K5 Premium Full Control Home jet washer is the perfect partner for cleaning large surfaces around your home. From patios and decking, to large cars, wheelie bins, fencing and garden furniture, this jet washer will help you bring new life to your home. The new full control system will help you achieve the best ever results in your home. Choose the correct spray lance using the symbols on the lances as a guide, based on the surface you want to clean.The LED display on the trigger gun will then show you the pressure setting you are on. If using the vario spray lance, simply twist the lance to move up through the different pressure settings, until you reach the right pressure for your surface. 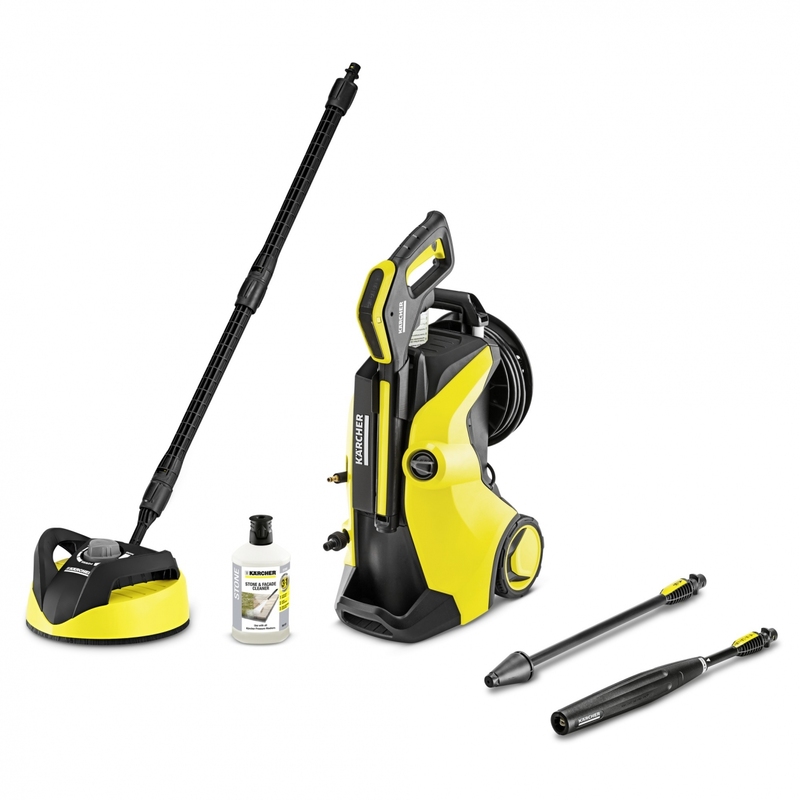 The T350 can clean your smooth surfaces up to five times faster than using a standard spray lance. The stone detergent helps to remove dirt, care and protect your stone surfaces. The hose reel on the back of the unit means you will be set up and ready to clean in no time by unwinding automatically as you pull on the high-pressure hose, reducing twisting of the hose. This hose reel also makes for a compact and tidy storage solution. This premium model comes with a five year warranty.